Why is kohlrabi healthy for babies and adults? Ketogenic diet menu for easy weight loss health Why is kohlrabi healthy for babies and adults? Kohlrabi is delicious and very healing brassicas, Latin name Brassicaoleracea. These vegetables have an unusual shape that somehow reminds of the apple, it is very popular in Europe and Asia, where it is often on the table of many peoples and cultures. It is actually a domestic version of wild cabbage and is eaten only when young. It is available in several varieties that differ in colour, and it usually comes in pale green and purple varieties. Planting Kohlrabi is very popular around the world, you can do it in your garden. These vegetables will provide numerous benefits to your health, accelerate metabolism and facilitate digestion, which is why we are sure that you will love it. Therefore, we will tell you more about how kohlrabi is useful for health and why do we recommend it, as well as what dishes you can prepare of it. Kohlrabi’s lower part is most often used. It may be slightly flat, round and partially elongated in shape, weighing about 250 to 500 grams. Kohlrabi leaves grow from the tree branches and usually are oval, slightly elongated and jagged at the top. They can be consumed, but most commonly tree of this plant is used. Cultivation of Kohlrabi is made from seedlings, although it is possible through direct seeding. Period of vegetation and resistance to low temperature of the vegetables allows it to be planted as a previous crop, as well as planted between let’s say, spinach and lettuce. The most commonly grown varieties are blue and white colours. To produce good kohlrabi cultivation must be carried out in an appropriate and adequate conditions. Namely, it is necessary to fertilize, but it does not hurt to feed it nitrogen or appropriate complex fertilizer in the period when there is a thickening of the tree. The period of sowing is in late August when, although it is possible before the end of September. Depending on when you plant, kohlrabi is ready for production in November or in December. As with any other vegetables, before starting the planting, it is necessary to prepare the land. This includes processing, removal of residual cultures, treatment against weeds and fertilization. It is important to know that for growing Kohlrabi you can use agro textile. Place it like that so it covers one or several ribbons of vegetables, and remove it before going to harvest. Another advantage of the material is that it prevents the influence of low temperatures on the plant, and in the best conditions it is expected to yield one to three kg per m2. Composition of Kohlrabi tells us that this is a very medicinal and healthy vegetable. It is much appreciated in Central Europe, but also worldwide. Its popularity is due to nutrients and minerals which are abundant in it, such as copper, potassium, manganese, iron and calcium. When it comes to vitamins, there is no lack of them, because kohlrabi contains vitamin C, A and K, and B complex vitamins. When you bite into this vegetable, feel its distinctive taste like cabbage and radish. The feeling in the mouth tells you that this is indeed a medicinal plant, because it is rich in antioxidants and valuable plant fibre. It has a beneficial effect on the overall digestion, removes bad breath, facilitates the work of the stomach and stimulates digestion in the intestines. If possible, eat it raw, as this will make the best use of all its health benefits. When it comes to calories kohlrabi can be considered a food of low nutritional value. It also contains only 24 kcal per 100 grams, and is highly recommended to those who keep a diet. In addition, it has about 2.50 g of protein, about 6 grams of sugar and very little vegetable oil. If you ate kohlrabi every day your health would be better, you would have stronger immunity, and you would feel awesome and full of enthusiasm. If we say that this is one of those plants that do not cause bloating of the stomach, you will love it. Lack of iron in the body is a serious health problem that can lead to many complications. Kohlrabi contains this mineral and effectively protects against anaemia. If you feel nausea, fatigue, headache, abdominal pain and are easily distracted you are very likely to have iron deficiency in the blood. It is useful to consume this vegetables, because it stimulates the absorption of nutrients from other foods. It is recommended that children eat it, because they are the most vulnerable to this health problem. This amazing vegetable is a good source of phytochemicals. The most important is to mention that it contains glucosinolates, one of the most powerful antioxidants, which effectively is preventing malignancies, primarily breast and prostate cancer. Kohlrabi preserves health and therefore it should not be surprising that many doctors recommend it to their patients, at least as a precaution. Potassium is suitable for the cardiovascular system, as it reduces the burden on veins, capillaries and arteries, making them flexible and viable. Therefore, the health of blood vessels improves, and it provides better circulation throughout the body. It reduces the risk of many diseases, such as heart attack and stroke, cleanses the blood of toxins and eliminates bad cholesterol. Over the years, there is damage and weakening of our bones, and that is inevitable. To better protect and strengthen bones, and thus slow down the aging process, it is best to eat foods that are rich in minerals. Kohlrabi for bone health is maintained and preserved thanks to having an abundance of manganese, iron and calcium. This vegetable is a natural remedy for the prevention of osteoporosis, and you will enjoy every bite of it knowing you are doing a great service to your body. The vision is what the man most heavily relies on and it is important that we pay attention to our eyes. There is nothing better than vitamin A that is present in kohlrabi, and it is a rich source of carotenes, including beta-carotene, which has antioxidant effects. This vegetable is considered one of the best guards of eye health because it helps prevent macular degeneration and protects against the appearance of cataracts. For those who want to regulate the metabolic process their choice should be this vegetable. 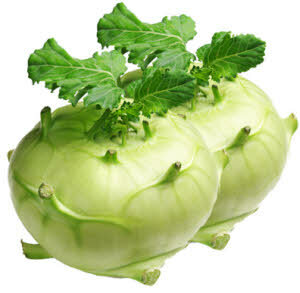 Kohlrabi, as we mentioned, is full of B vitamins, which plays a key role in the processing of the enzyme in the body. Even you do not have to eat it every day to improve metabolism - just once a week and eat it raw! Like other vegetable crops this is an excellent source of dietary fibre that help digestion. Kohlrabi helps the intestines and eliminates constipation, reduces cramps and bloating of the stomach. Overall, it positively influences the quality of your digestive system, and is very suitable for dieters. You will surely love this vegetable if you want to lose weight. As we said, kohlrabi contains calories in extremely small quantities, and on the other hand it is rich in fibre, which are useful for digestion. Its consumption will have a sense of satiety, and is ideal as a snack between meals. In this way you will avoid overeating, and the scale will show that you are lighter than before. Thanks to the fact that it contains potassium, kohlrabi is considered one of the key plants that favour the muscular and nervous system. It helps us to endure any physical effort to breathe properly, but also that our nerves are functioning properly and that they react. Therefore, a high concentration of minerals has a positive effect on your body and ensures that we are in great shape. This remarkable vegetable is a great choice for infants and babies, because it is rich in minerals and vitamins that are essential for proper growth and development in their age. The introduction of solid foods is being implemented gradually, sometime after six months of age. Kohlrabi for babies is an ideal food and you will definitely need to prepare it to your child, so we therefore recommend the following tasty dish. Wash and clean kohlrabi, and chop finely, also clean the potatoes and cut them into slices and put them together in a saucepan, cover with water and cook. Just before the end insert a bit of broccoli and allow it to boil for about five minutes. Drain the water and cooked vegetables give a good mash. You can add a little water in which it was cooked to give the mush an adequate density. Mashed Kohlrabi is even tastier if poured with a small amount of olive oil (just a few drops), after which it can be served to your baby. It is very important that this vegetable is consumed at an early age, either fresh or cooked, because adults love it in many dishes. We recommend you the best dishes of Kohlrabi that you should certainly try. Peel kohlrabi, cut it into cubes and pour it into a pot. In another bowl, mix the yogurt and sour cream with finely chopped white onions. Add the parsley and mint, if desired, sprinkle with salt, pepper, two tablespoons of olive oil and some lemon juice. Give it a good stir and then pour over the Kohlrabi. Sprinkle with a little red smoked paprika and place it in the fridge. Kohlrabi salad is easy and ideal meal that can be substitute for dinner. Peel and wash the onion and then chop it into small cubes. Heat the pan with oil and fry the onions. Peel and wash Kohlrabi and cut it into thin sheets. Then add to the pan, season with salt and simmer until tender. Sprinkle with the finely chopped parsley, two tablespoons of flour and a little cayenne pepper. Mix well and add a little water along with 2 dl of cooked tomatoes. Kohlrabi stew can be spiced up with the leaves of this vegetable. Wash and peel Kohlrabi, then insert it whole in the pan in which you have previously put the soup to boil. Leave it there until tender, and remove it and cut it into cubes, mash or grind in a blender. Then return it into beef soup and, if desired, add salt, pepper and place a tablespoon of spice. When cooked, sprinkle with finely chopped dill. At the very end, mix a cup of cream with one egg and pour this mixture into the pan. This meal is a great choice for lunch during the summer days. Although allergic reactions to foods are common, kohlrabi does not cause side effects in humans as it does not contain allergens to which people are sensitive to. It can be consumed without concerns and is recommended to eat one at least once a week. When it comes to price of Kohlrabi, it is about 2 dollars per kilogram, which means that it is very affordable and available to each of us. We recommend that you buy it at the market and be sure to notice that the tree is a pale greenish colour. Keep it in a cool place, preferably in the refrigerator. These vegetables should definitely be included in the food for you and your family. Take advantage of all the healing properties kohlrabi has to offer.